Inside the Arctic Circle, the residents of Kiruna, Sweden, are accustomed to colorful lights in the night sky. Usually they are auroras, dancing in response to the solar wind. On Jan. 23rd, Mia Stålnacke witnessed a display that had nothing to do with space weather. "The light pillars were insane!" she says. 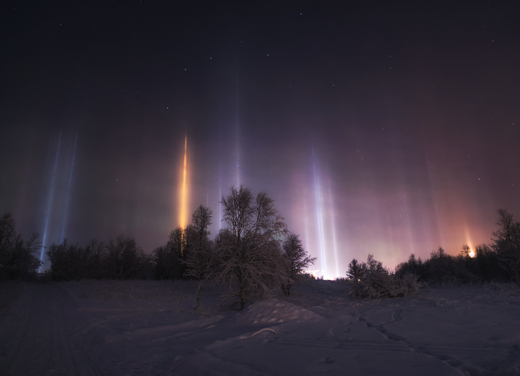 Light pillars are caused by ice crystals in the air which intercept manmade lights and spread them into colorful columns. No solar activity is required for the phenomenon. The only ingredients are ice and light pollution. Warm-orange colors arise from high pressure sodium lamps, while blue-white columns are caused by modern LED lamps. "Conditions were just right for these spectacular pillars to appear with temperatures just below -20°C," says Stålnacke. "The shorter orange one on the right is the rising Moon."